"I came over the hill and everything was in flames"
We recently had a visit from Christopher A. Hauck D.C., owner of Framingham based Chiropractic Solutions. Chris is a former client and a really great guy, and we recently sat down with him to get an update about the success of his business after SMW helped him recover from a devastating fire. The discussion brought back a lot of memories, and it reminded us of how important our work can be for small businesses that experience catastrophic events. Chris experienced the nightmare scenario of any small business owner: the phone call in the middle of the night, the mad dash to his office, and the view of his entire operation literally going up in flames. For Chris and his wife, it was already an incredibly stressful time. The IRS was auditing him due to an anomaly from a previous filing, and he was undergoing a routine chiropractic board audit. Add to that the time spent caring for a rambunctious 2-year-old and the sleeplessness of tending to an 8-week-old baby - life was crazy before the fire! Luckily for Chris, he had up-to-date insurance. The first thing he did that morning – with his office still smoldering – was call his insurance agent. 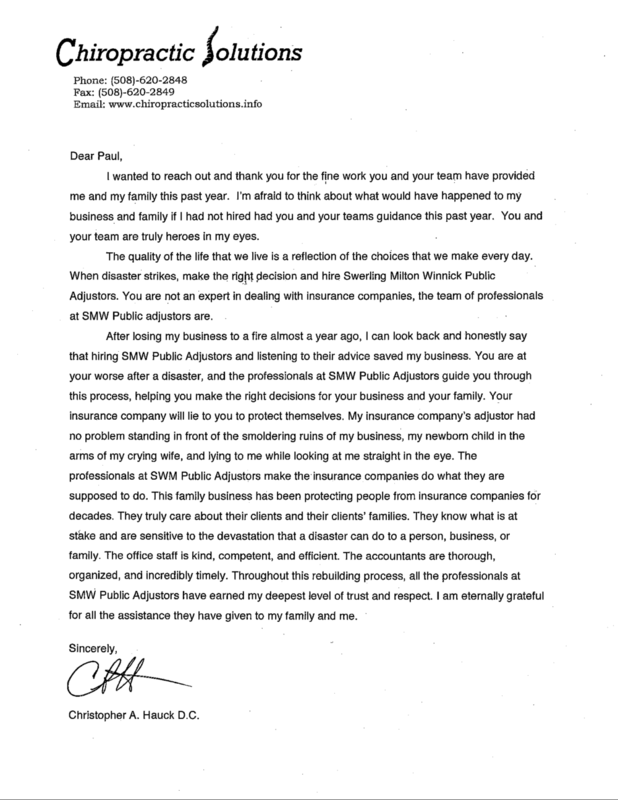 He confirmed that Chris had coverage and explained what was covered by his policy. Chris also had clients to think about. He met with his employees the following morning and commenced the search for new office space. Within a week he was again seeing clients in a loaner space using borrowed equipment. Then he met with the adjuster from his insurance company. “He wasn’t a good listener,” Chris recalls diplomatically, “which made me think I should get a public adjuster.” Chris’s insurance agent actually advised against a public adjuster, expressing concern about the contingency fee. It was Chris’s accountant who had used Paul Winnick and his staff for their own claim, and strongly recommended that he talk to Paul and his staff. Chris’s #1 focus after the fire was signing a new lease. He needed a new home for his business, which involved real estate shopping and then negotiating the lease. SMW convinced the insurance adjuster to approve the temporary relocation expense. “I didn’t even know it was a thing to have the insurance company pay for the temporary relocation,” he says. Chris was poised to sign a 5-year lease, but SMW convinced him to consider another option: sign a lease for one year instead, and wait to see what would happen with the building reconstruction. “It was a leap of faith, and a really hard decision,” Chris says. “But I took SMW’s advice and signed a one-year temporary lease”. SMW then started the arduous task of compiling the list of damaged personal property to ensure Chris didn’t miss any opportunities due to coverage limitations. X ray machines, computers, chiropractic tables, supplies, even the improvements he made to the space – SMW documented all of it. SMW commenced the process of getting his Business Interruption claim underway, and submitted multiple interim claims. In addition to this assistance, Chris emphasized the value of having SMW engage with the contractors who were doing the temporary build out. When the claim for the temporary space was being put together, it was helpful that SMW and the contractor worked together to document the cost of construction and explain the nuances of the temporary buildout. SMW also ensured that payments kept coming. Chris wasn’t earning steady income from clients, and contractors need to get paid if you want them to keep working. SMW made sure Chris did not have to pay out of pocket and remained at the top of the insurance company’s attention list – despite being one of their smaller portfolio items. Do not go through the claims process without a public adjuster! It’s really up to you to know what to insure. Things add up fast, so reassess your coverage routinely and make sure you have enough coverage. Insurance companies are hard to deal with. You can’t win a game when you don’t know all the rules. SMW is proud to have played a role in helping Chris and his wife return their focus to the demands of a young family and a growing business. Chris himself calls the support he received from SMW “a life changer”.